This incredibly chocolaty and creamy quick-bake peanut butter pie is Vitaly Paley’s grown-up version of a Reese’s Peanut Butter Cup. 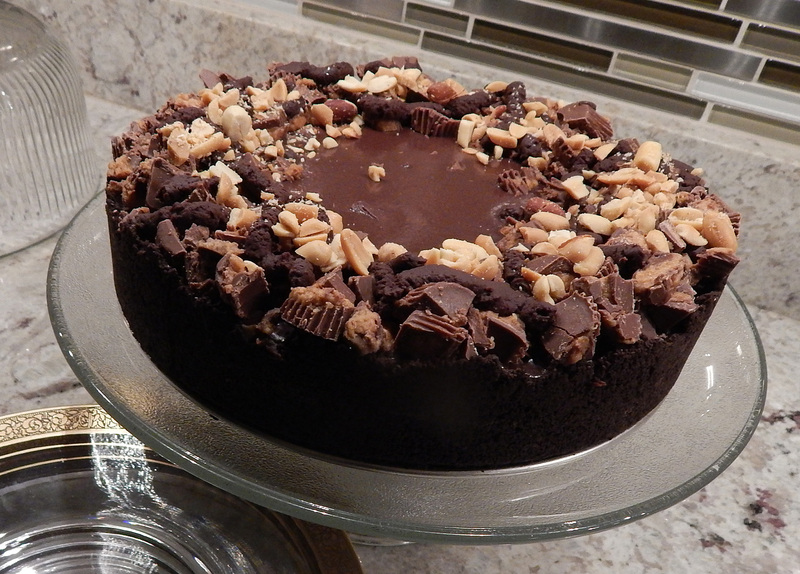 Friends think it’s strange that even though I don’t eat dessert, I still love to bake. I guess the process helps fulfill my inner need to create something visual. 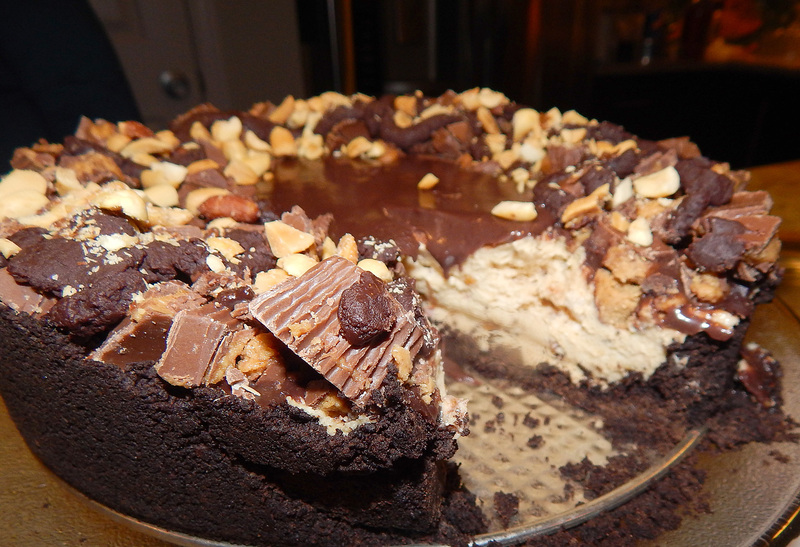 So in that vane, not content with Vitaly’s topping, I took it to another level and rimmed the edge with 12. oz of coarsely chopped mini Reese’s Peanut Butter Cups and a drizzle of melted semisweet (or white) chocolate. about 3 more ounces of either semisweet chocolate or white chocolate pieces, melted in microwave and drizzled over topping. Preheat the oven to 375°. In a medium glass bowl, combine the chocolate and butter and microwave at high power in 20-second intervals until the chocolate is melted. Stir well, then stir in the cookie crumbs. Press the cookie crumbs over the bottom of a 9-inch springform pan and 1 1/2 inches up the side. Bake the crust for 10 minutes, or until set; the crust will continue to firm up as it cools. In a large bowl, using a handheld electric mixer, beat the cream cheese with the peanut butter, sugar and vanilla extract until blended. In another large bowl, using the same beaters, whip the chilled cream until firm. Fold one-third of the whipped cream into the peanut butter mixture to loosen it, then fold in the remaining whipped cream and 1/2 cup of the chopped peanuts. 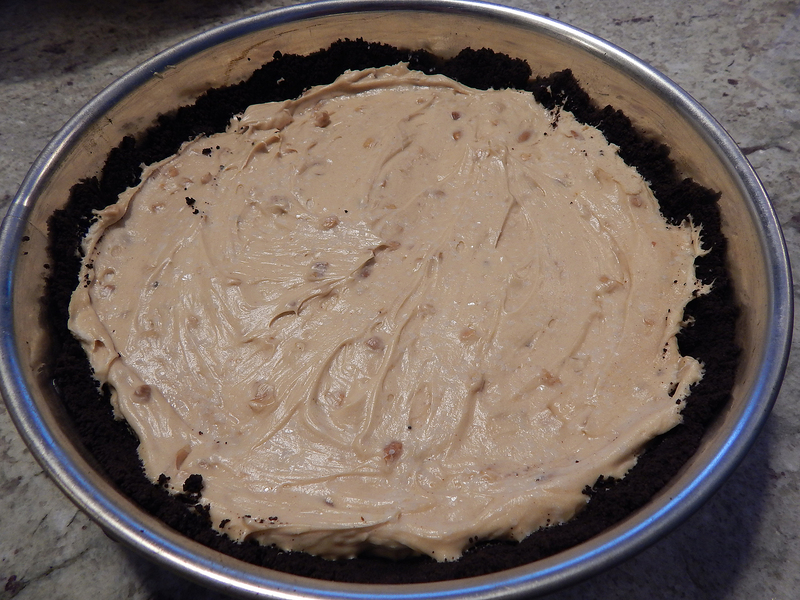 Spoon the filling into the crust, smoothing the surface. Sprinkle lightly with salt and refrigerate until set, about 3 hours. In a medium glass bowl, combine the chocolate with the heavy cream and microwave at high power in 20-second intervals until the chocolate is melted and the cream is hot. 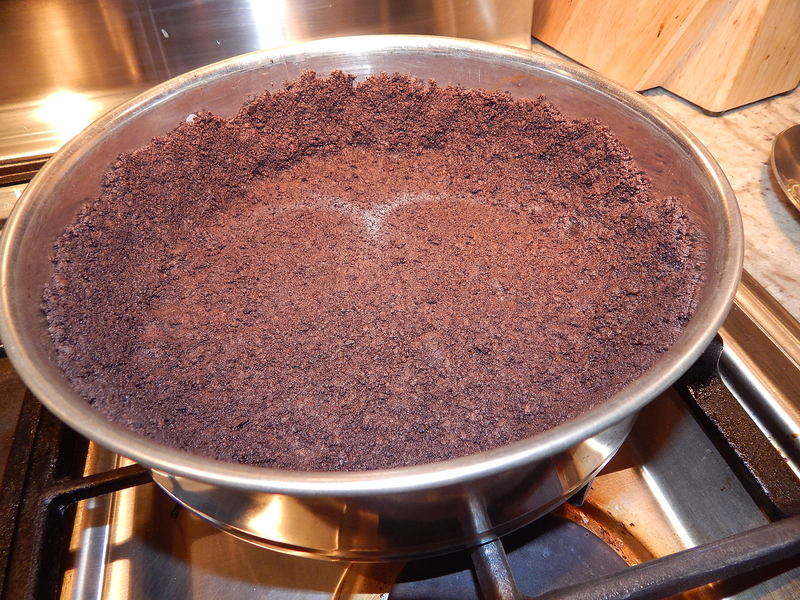 Stir the chocolate topping until blended, then let cool to barely warm, stirring occasionally. 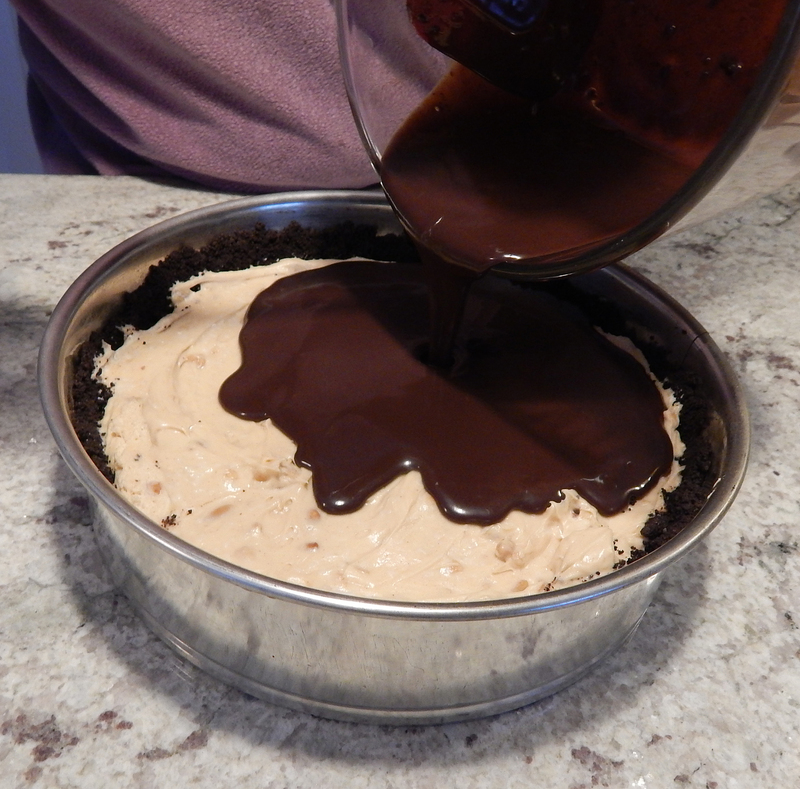 Spread the chocolate topping over the peanut butter filling and refrigerate until just firm, about 15 minutes. 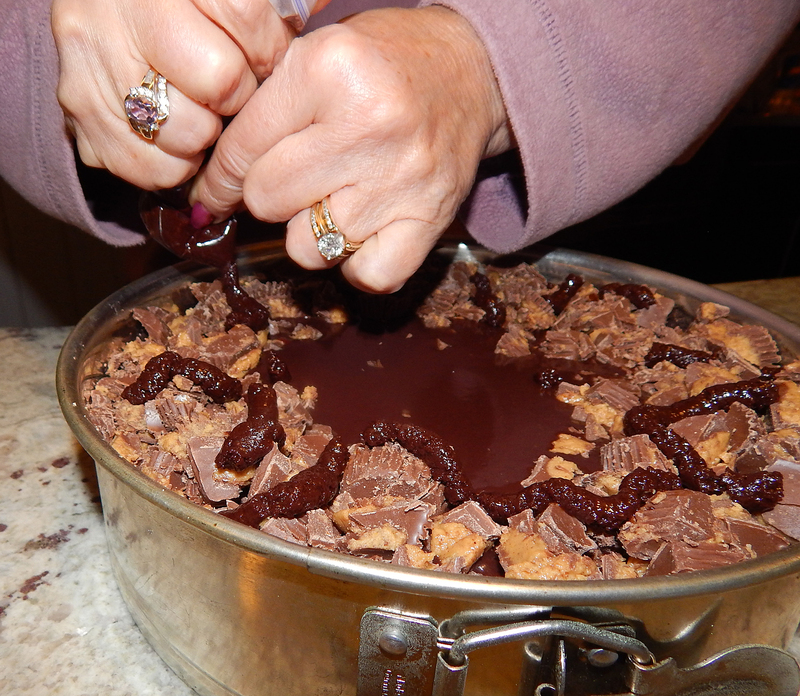 Sprinkle the remaining 1/4 cup of chopped peanuts around the edge of the pie. Carefully run a thin knife around the pie crust to loosen it, then remove the springform ring. Using a sharp knife, cut the pie into wedges. Run the knife under hot water and dry it between each cut. MAKE AHEAD: The pie can be covered and refrigerated overnight. Garnish with the chopped peanuts before serving (which is what I did.) Serve the pie chilled or slightly cooler than room temperature. And don’t blame me if your scale reads a bit higher than usual!